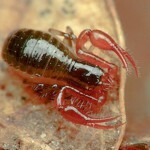 The cephalothorax and opisthosomal tergites are deep olive, the former tinged with red; pedipalps reddish-yellow, partly tinged olive; length of body: 3.3 mm. This species has not yet been recorded outside Britain. It has been found only at Glengariff in 1909-1910 (under the bark of flaking Arbutus trees) and also in 1971 (on a cliff top in Sphagnum moss) and in 1982 in leaf litter; and Colne Point, in Essex in 1950 and later (in salt marsh debris and litter amongst the shingle). In 1984-5 specimens resembling N. carpenteri have been found in a quarry in S. Wales, but these do not have such a high rounded galea as the Irish and Essex specimens. The odd distribution of this species suggests that it is either more widespread than it would first appear, or, more likely that there are more than one species involved. A larger sample of material will have to be examined before this problem can be satisfactorily resolved. Beier (1963) noted that N. carpenteri was similar to N. (N. ) ischyrum ischyrum (Navas 1918), a species found in Spain and Portugal. It is not appropriate here to go into the details of the similarity, which point to the Irish population, at least, being an example of the relict Lusitanian fauna associated with southern Ireland.